Tucked away in the recently tabled Railway budget of 2012 , between paragraphs on Disaster management and Housekeeping is a significant proposal that will bring a cheer to designers and rail-users alike. 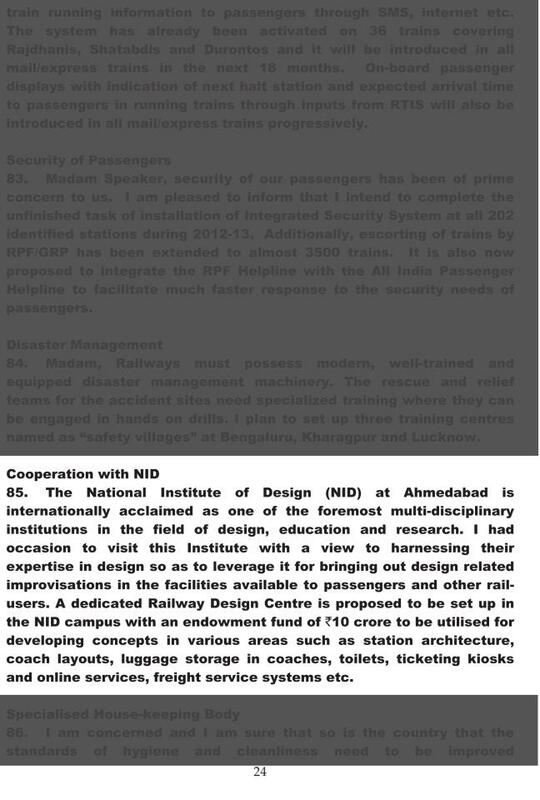 The minister has proposed setting up of the “ Rail Design Centre” at NID, Ahmedabad to leverage design for improving the facilities at railway stations and the trains. An idea that is both timely and note-worthy. For the first time, the government recognises the need to improve passenger facilities through design intervention. This is will hopefully, signal the end of passenger woes. The whole user experience needs an overhaul, not just improvisations. It begins with the form that is difficult to fill, queues that extend out of the shelters during rush hours, signages that do not guide the passengers properly at the station and announcement boards that are more stylish than substantive. Ever traveled with an elderly, a child or a differently-abled person on a train? You don’t need to be convinced that the trains need to be redesigned to be made more inclusive. High steps, sliding doors, unergonomical heights of taps and dustbins, all signify that things have been designed for the non-existent average person. Berths that are a tad short for the above-average, windows that get stuck in monsoons, bathrooms that flood the whole compartment, lunch packets that are difficult to open, tables that are too far from the seat, plastic covers that don’t work during the sweaty Indian summers, this list can go on. Anyone who has traveled in the trains would agree that Design has a large role to play to improve the overall user experience and NID is more than suited to do the job. For, far too long, the Indian railways have relied on engineers to design the bogies, advertisers to design the communication and bureaucrats to decide on passenger facilities. This is now a tacit recognition by the Indian Railways of the professional designer, who has a definite role to play. This is a dream opportunity for the design community. Every student who went through NID’s education programme would probably have in his portfolio, a hypothetical project of a better design of the railway’s facilties. During my time at NID, I have seen students developed better trolleys for luggage’s, berths that fold easily, eating plates that contain well and don’t spill, better designed reservation forms and a folding mug for the toilets. All these and more can now be dusted and brought to life, as and when the proposed centre becomes operational. It will also be an opportunity for all the vendors who supply to the Indian railways and the good word on design will spread. The government departments are suddenly sitting up and taking notice of design. The Handloom and handicrafts ministries are already investing in design. The MSME ministry has set aside Rs 77 Crores to promote design as a driver to manufacture better products made by the small and medium-scale enterprises with their ‘ Design Clinic scheme’. There are so many other sectors of the government that can now think in terms of investing in design. The agriculture ministry can set up design centres to make better implements and products. The health ministry can easily use ‘design thinking’ to make better healthcare services. The rural development ministry can easily use design to really develop the rural areas of our country. The education ministry can put their money to good use by leveraging design in education. This is just the beginning, but design has this power to transcend barriers and solve problems across all the sectors of the economy. In a recently concluded design conference, the international product designer Karim Rashid said that ‎”If India does not establish some brands soon, it will be too late since all the imports will just take over the country. It was a shame that the hotel I stayed at in New Delhi had Italian lighting, Italian furniture, German sinks, German faucets, French products,” (as quoted in The Economist.) If Karim Rashid had not stayed in a star hotel and spent a night in an Indian train, he would have realized that designers in India need to spend more time in addressing the problems of the people and would have had a different take on Indian design. And as for the Indian Railways, it is doing well by putting design on track.